"Secretary of State Hillary Clinton gets a surprise when a scantily-clad Hawaiian performer with a flaming torch runs through her photo op with Hong Kong Chief Executive Donald Tsang (曾蔭權). Honolulu, Nov. 12, 2011." The EAP Media Hub made it sound from the above description as if the "scantily-clad Hawaiian performer" streaked through Secretary Clinton's photo op. In fact, some media outlets call the runner, a streaker. Um, you don't really think this is some random performer who just runs around with a fire stick, do you? 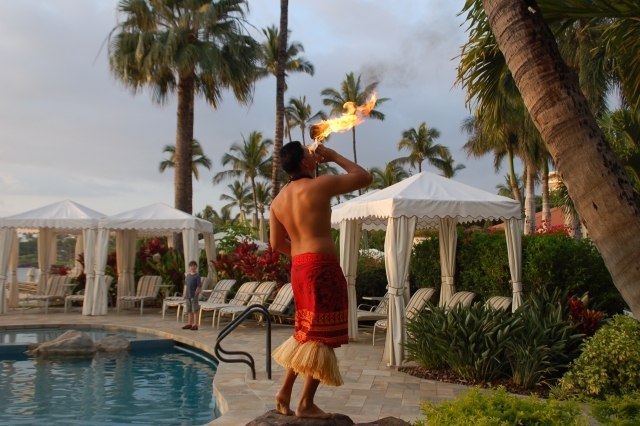 Have you ever heard of the Hawaiian torch lighting ceremony? Traditionally, a Hawaiian native runs on the beach with a lighted torch at dusk and lights each tiki along the way. It's part of the Hawaiian cultural tradition. See this one, also "scantily-clad," thank goodness he's not wearing a suit! Photos of other torch lighters here, here and here. Folks, they're supposed to be dressed like that, really.